For the first time in many years, the Miami waterfront is changing its form. You can thank developer Jeff Berkowitz, president of Berkowitz Development Group. Workers are busy reshaping the area that shoots off the northern end of Bayfront Park to accommodate Mr. Berkowitz’s dream project: the 1,000-foot SkyRise Miami observation tower and vertical adventure park. Begun in 2014, the unique development has meant methodically reforming the edge of the city into Biscayne Bay in preparation for the massive foundation that must be constructed to hold SkyRise. “Construction is proceeding well,” Mr. Berkowitz told Miami Today this week. The most recent changes resulted in another pier at the marina. 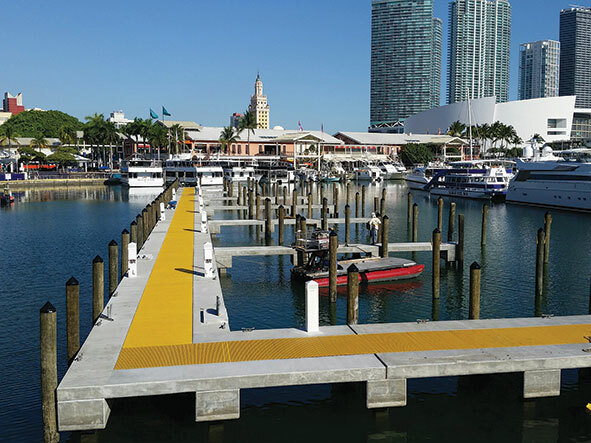 “We have added a fourth pier to Miamarina at SkyRise’s expense,” said Mr. Berkowitz, noting that even more changes are in store for the marina. “We are in the process of installing new utilities to service the marina, as the existing utilities are located beneath the surface parking lot, which ultimately will be demolished and excavated to accommodate the SkyRise foundation,” he said. SkyRise Miami is to include observation decks, nightclubs, a flight simulator ride and a bungee jump-like platform. The planned glass and steel tower looks like a capital “R” as it slopes back toward the area of the Hard Rock Cafe. The tower is to rise on land that was the parking lot for Hard Rock. Mr. Berkowitz arranged a sublease of nearly 2 acres from Bayside Marketplace, which leases that section of waterfront land from the City of Miami. A major step was achieved with the vote of city commissioners last June approving the new leases and subleases. City voters last August voted to permit the use of city land. The move to build SkyRise turned out to be the catalyst for a major upgrade to Bayside. The high-profile commercial development promised in new leases to sink $27 million to $35 million into renovations. In December, Miami-Dade County commissioners approved a variance allowing SkyRise to begin construction. The four-year construction variance allows developers of the project over the water in front of Bayside Marketplace to use staging barges for construction, a procedure that county code prohibits. County commissioners also approved $9 million in economic development grant money to help pay for infrastructure related to the tower. That move spawned litigation. Raquel Regalado, a candidate for county mayor, and Norman Braman, a wealthy car dealer, are suing the county and city, alleging the public was misled in the August referendum and saying that no public money should be spent in relation to SkyRise. Mr. Berkowitz has remained consistent in saying that no public money will be spent on the tower itself, estimated to cost $430 million. Mr. Berkowitz said he hopes to raise 60% of the tower’s total cost using the EB-5 visa program, which allows foreign investors of $500,000 to obtain green cards. His team has been marketing SkyRise abroad. Mr. Berkowitz has also said he’s put a bundle of his own money into the venture. Work at the site will pick up this summer and fall, said Mr. Berkowitz. “We anticipate completing the marina work and the utility relocation work by mid-June,” he said. “We expect to demolish the marina offices and the parking lot and to begin the excavation, soil conditioning and extensive piling work for the tower’s foundation this fall,” Mr. Berkowitz said. Berkowitz Development Group estimates 3 million visitors a year to SkyRise Miami, which would make it the largest attraction in South Florida and fifth largest in the state. The targeted opening for SkyRise is late 2017. Great start to a totally unbiased article that wasn’t paid for by the developer! I like the idea but getting 3 million extra people in and out of Bayside may be a logistics nightmare spilling over onto Biscayne Blvd and beyond. Too bad there isn’t a mass transit connection at Bayside. Guess it’s too late to require Berkowitz to pay for a MetroMover station for a future stop (with other stops at PortMiami). Oh, well, welcome to Grid Lock City. My fear is that Berkowitz will do the same thing he did at the Children’s Museum on Watson Island where he has a marquee electronic billboard illegally attached to the museum advertising everything from liquor to cruise vacations. Does anyone know if there will be restrictions to him flashing advertisements 1000 feet up on Skyrise , or did the Miami commission neglect that ?